The design for Gill Reef is based on the extremely efficient, elegant oyster gill. One oyster, in the height of the season, can filter up to 50 gallons of water per day. Haseltine observed oyster gills under the microscope and then employed the concept of biomimicry, Mother Nature’s blueprints, to create the structure’s design. 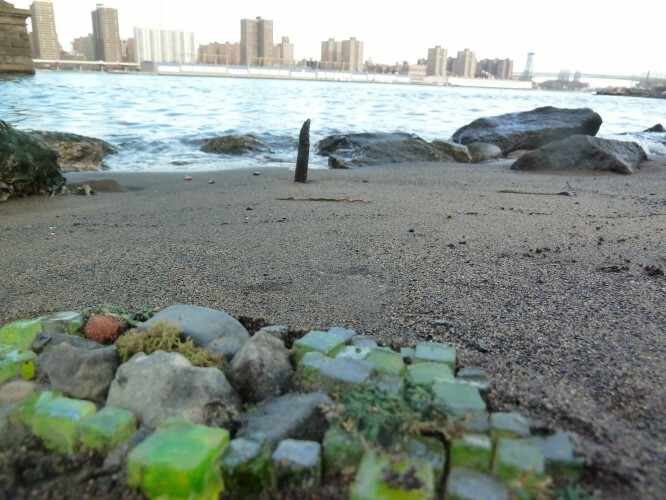 While working on the sculpture, she incorporated feedback from her students at the time, marine biologists, marine engineers, and members of the New York Department of Environmental Conservation. 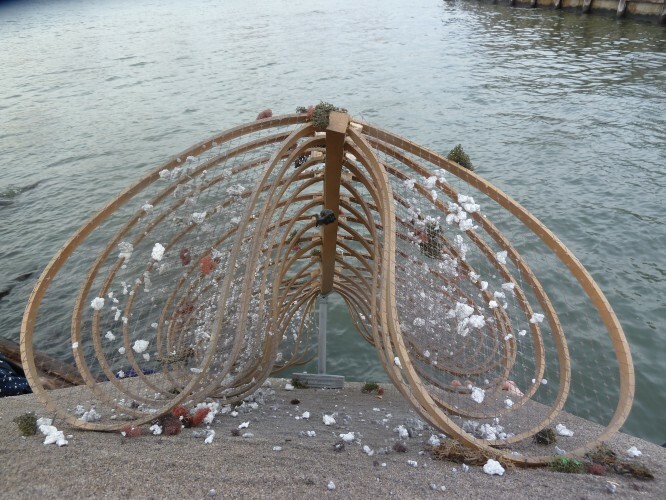 Every aspect of the design strives to create the ultimate urban habitat for oysters. The sculpture is engineered for twelve to fifteen foot deep waters with underwater currents ranging between four to six knots. Oysters thrive in conditions where they receive the maximum amount of water flow so the design is open and reticulated. This habitat is designed to be out of harm’s way—submerged at the bottom of the river. 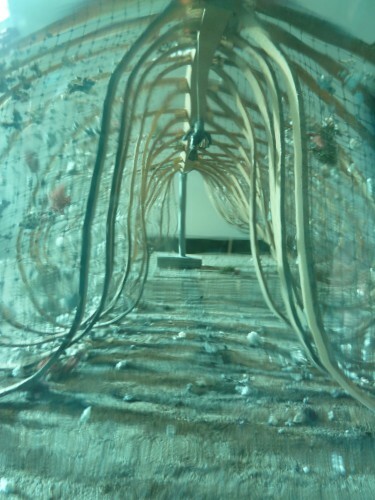 The reef structure is lifted above the sediment allowing every oyster access to the contents of the nutritious currents. To further the likelihood of spat (larval oyster) settlement, the reef structure is coated with lime-based substrate. An open channel in the middle and between each rib gives entry to divers who can monitor growth. 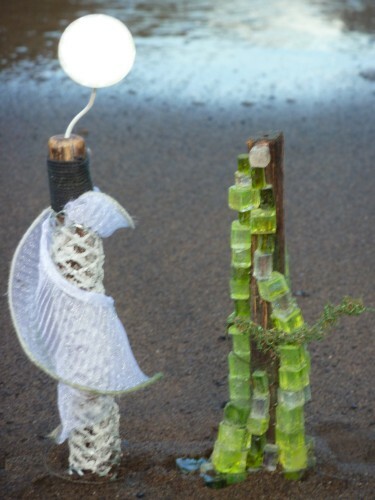 The Gill Reef can also operate as a land sculpture and teaching tool. Mr. and Mrs. Piling are two different examples of possible designs for reef habitats on old pilings in urban areas. In most urban waters, old pilings are treated with a toxic preservative called creosote which classifies them as hazardous waste. These pilings are a perfect place to build oyster reefs because they cannot be removed and therefore do not interfere with any existing waterway traffic. 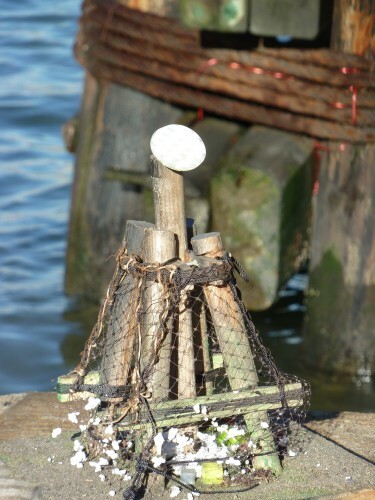 Mr. Piling is depicted here with blocks of foamed and textured recycled glass which creates a substrate structure that oysters like to cling to. To create: mix calcium carbonate into molten glass to produce textured foam. Mrs. Piling is cloaked in calcium-carbonate mineral accretion created by low volts of energy running into a metal framework. Calcium carbonate is the best possible substrate for spat settlement, and if grown slowly, is three times the strength of concrete. The light volts of electricity boost the immune system of the organisms that cling to them making them more impervious to pollution and water temperature fluctuations due to climate change. Ultimately, these structures could help restore oyster reefs which protect the shoreline. There is also evidence that the light electrical field attracts oyster larvae. 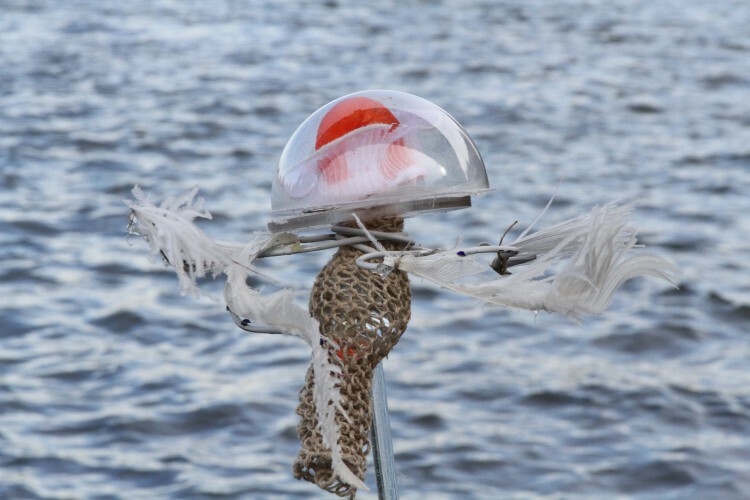 Madame Jellyfish is a design for a solar-powered reef buoy in a self-contained unit that acts not only as a navigational marker, but also as its own miniature floating reef. If done properly, the solar panel could generate its own hydrogen as well as power the reef’s structure below it. 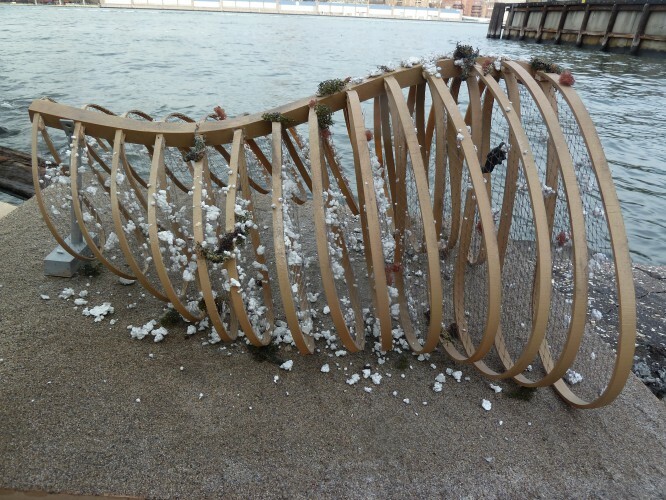 The solar-powered reef uses minerals dissolved in sea water to grow calcium carbonate mineral accretion. 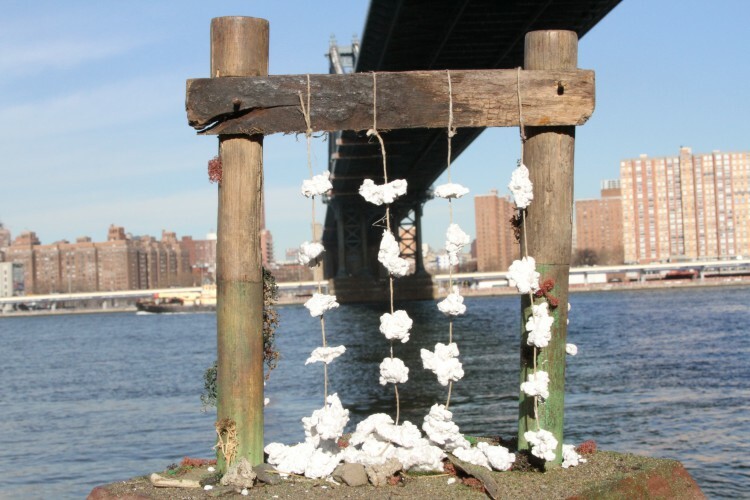 Midden Veil features clusters of oysters laced to pilings. The oysters are arranged this way so they receive a lot of flow-through of nutrient-rich water which eventually creates a reef underneath. 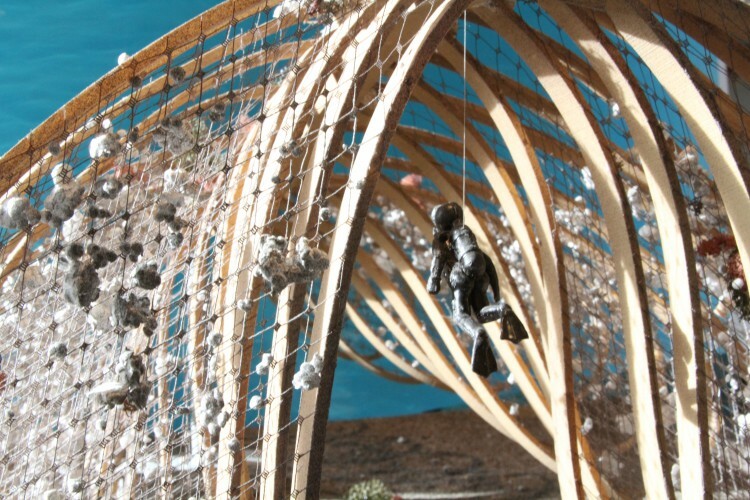 Oyster Hotel creates an oyster habitat within the pyramid-style pilings using substrates that are attractive to oysters. Some of the substrate would also be “pre-spatted,” meaning the baby oysters would already be attached. Rockin’ Glass Reef foamed recycled glass with “pre-spatted” baby oysters already attached is placed in already existing rocky outcroppings. The more oysters planted the larger the chance of reef proliferation as it takes 100,000 oysters spawning simultaneously to create a reef.